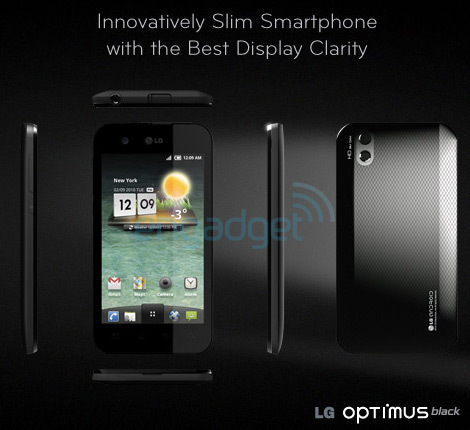 LG is busily preparing its CES presentation area right now, where the well known Optimus 2X is being joined by a pair of intriguing new devices, the Revolution you see above, an LTE-connected handset that seems destined to ride Verizon's minty fresh 4G network, and an Optimus Black (pictured after the break). The latter handset promises the "power of light" housed within an "innovatively slim smartphone with the best display clarity." Both the allusions to slimness -- we've found specs listing it as a 9.2mm-thick device with a 4-inch screen -- and display prowess match up to the LG "B" device we've seen leak out previously, which LG itself promised will be launching at CES. Other details include Wi-Fi Direct certification and the world's first two megapixel front-facing camera. It's gonna be a fun week, to be sure.